Aquaman. DC Comics. 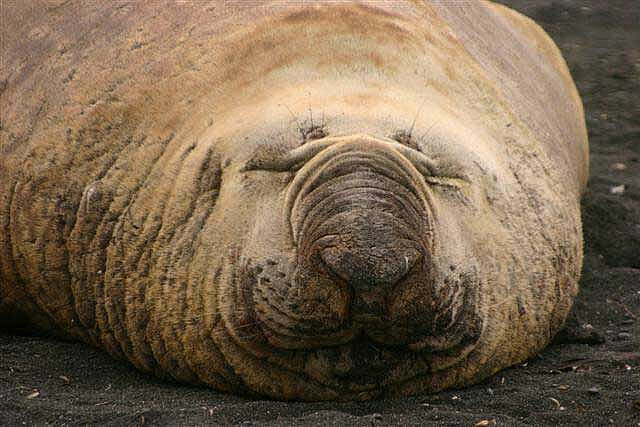 This is not a man familiar with the term “blubber”. Aquaman is not just a human, he is an incredibly buff human. Look at his picture. If the man has more than 2% body fat, I’d be shocked. In contrast, warm-water bottlenose dolphins have at least 18 to 20% body fat. Anyone who SCUBA dives knows that, even with a 12 millimeter neoprene wet suit, after a few hours in 80°F water, you get cold. 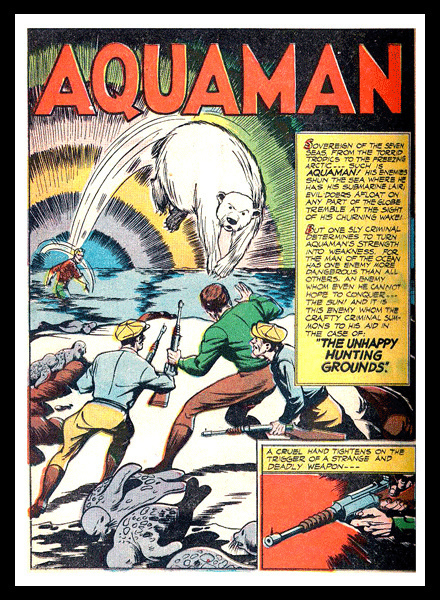 Aquaman, lacking any visible insulation, should have slipped into hypothermia sometime early in More Fun Comics #73. He is better built for the beach than the frigid deep. Let assume that, through the magic of comics, Aquaman has managed to overcome the challenges of temperature and osmotic pressure. He still must face the dreaded threat of all divers – decompression sickness: the bends. Aquaman has gills, which means that he is extracting oxygen from seawater and pumping is across a membrane. At pressure, such as what you might experience a few hundred feet beneath the surface, oxygen is toxic, even fatal. Divers breathing pure oxygen suffer traumatic injuries. Even if he somehow manages to extract an appropriate mixture of oxygen, carbon dioxide, and nitrogen, Aquaman still must contend with the crippling effects of gas expansion in his blood stream. As he changes depths, bubbles of nitrogen come out of solution, clogging his circulatory system and causing possibly fatal embolisms. Even deep-diving marine mammals suffer from the bends. Sperm whales cope with gas accumulation by depositing excess gasses in their bones, creating a porous, brittle skeleton, riddled with osteonecrosis — patches of dead bone. For a superhero, bones that snap like a sponge are not conducive to fighting evil. And Aquaman fights, and swims, and pushes his body to its supra-physical limits. Aquaman is one of the fastest swimmers in the ocean. He chases German U-boats, out-swims dolphins, can even catch up to a torpedo. The Justice League reports that Aquaman can swim at 10,000 feet per second. 10,000 feet per second is more than 3 kilometers per second, or 6,800 miles per hour. We’re talking Superman speeds, here. For comparison, Olympic swimmer Michael Phelps can sustain a speed of 4.7 miles per hour. To maintain that pace, Phelps burns about 1,000 calories per hour while racing, up to about 6,000 calories a day. If Aquaman were to spend an hour swimming at full speed, he would burn 1.4 million Calories. Even to survive a day strolling at a leisurely 10 miles per hour, enough to travel from Beaufort, North Carolina to Bermuda in about 3 days, Aquaman would need to replace 48,000 Calories each day. The ocean is full of food. Tuna contain a hearty 1440 Calories per kilogram, so Aquaman could get away with eating a bit more than 33 kilos of tuna per day. Unfortunately, tuna are fast. Aquaman would have to burn even more energy chasing them down. And that’s assuming he wants to eat a dense, energy rich fish. Knowing Aquaman, he probably understands tuna over-fishing better than most. Odds are, our hero is eating from the bottom of the food chain. Actually, Aquaman may not have a choice in the matter because, as the ocean acidifies, the enamel in his teeth will literally begin to dissolve. Since he won’t be digging his pearly whites into anything substantial, it looks like plankton soup is on the menu. This means that, just to stay alive (let alone do battle with the Legion of Doom), Aquaman must eat pretty much continuously. Golden age Aquaman can talk to sea life. Modern iterations can communicate telepathically with ocean creatures. Even excluding humans, the ocean is a brutal place. Aquaman, alone is consuming untold thousands of animals to sustain his svelte, 48,000 Calorie-per-day, figure. Seeing as he must continuously eat, there’s little time for cooking, or even humanely killing his prey. He is surrounded by the psychic screams of every zooplankter that enters his cold-hearted gullet, each one, begging for mercy as it plunges into his hypertonic stomach. His victims aren’t the only ones he is forced to hear. Throughout the ocean, predators stalk their prey, parasites consume the eyes, tongues, and gonads of their unwilling victims. Superman avoids the screams of the suffering by being a callous jackass with some hyper-narcissistic code that forbids him from “interfering” with the path of human history (which is why he’ll swoop in to stop a mugger, but has no problem letting Adolf Hitler march across Europe). Aquaman, however, loves the ocean with every porous, necrotic bone in his body. He is its protector. Which means that every dying sea creature breaks his tachycardic heart. And we haven’t even touched the consequences of an ocean exploited by human beings. Aquaman can see the scars left by every trawl, can feel the life being sucked out of the ocean, knows the name of every fish, dolphin, and crab whose life has been taken by our nets and lines. His life is the constant, horrible drone of unspeakable, unstoppable death. The acidification of the ocean will have numerous environmental consequences, but thus far is not going to affect the teeth as stated in the article. The point of concern would be if the ocean acidity dropped below 5.5. At 8.14 the ocean is still relatively basic compared to our human physiology. Therefore dissolving teeth are not a concern. Thanks! Great to get the facts straight from an expert. I hope you will find it appropriate to, for the sake of narrative, accept the conceit that Atlantean teeth are more akin to gastropod shells than our own terrestrial chompers. I hate to say it, but most of this post can be ignored under the rubric “assume a super hero.” I mean, we could go on forever about how Super Man would be torn up by flying that fast, shouldn’t be able to hold his breath in space without decompression, etc., but we don’t, because he has super powers. For Aquaman, I presume that his super powers save him from the problems of pressure, the bends, blood brain barrier, etc. The last part was pretty interesting, though, the bit about being forced to listen to the thousands of screams, all the time. That would be rough. As Louis CK pointed out about mermaids… Aquaman swims around in pee-pee. If there’s a whole population of mermen and mermaids underwater, their biological waste has to go somewhere. I never really thought about it until I heard him point it out. Yuck. That has to be the most horrifying aspect of the whole thing. This post is full of awesome. Thus spake Zuska. Just Ran across this ! – Fantastic bit of teaching. I wonder if a research grant into some of his more inspiring exploits is feasible? Uh… Aquaman is shown to ACTIVELY use his marine telepathy. Meaning, it’s not always on, all the time. More recently (post Nu52), Aquaman has told people “I don’t talk to fish, I command fish”. I’m sure someone else pointed this out before me, but yeah, Aquaman does not hear the thoughts of every sea creature all the time, only select ones when he choses too. This is brilliant. Just brilliant. Applause for you, Sir. Thanks for an amazing read! I teach a middle school science class; linking to your blog from mine. Aquaman should really have become a villian shouldn’t he? With the over fishing and pollution he should be taking it to the land dwellers and coming into conflict with countries and heroes. You’ve made a few presumptions that don’t follow, though. For one thing, zooplankton have no brains, so they won’t be psychically screaming. Even so, Zooplankton only makes up about 18% of all plankton. Even most invertibrates in the ocean wouldn’t have enough of a brain to be read or controlled by Aquaman, so his only true allies would be fish (ichthyes), sea mammals, cephalopods and arthropods. That’s still a pretty huge arsenal of allies, though. It seems you’ve made the presumption that Aquaman’s “fish telepathy” is always active. That isn’t necessarily so. Following fictionally-defined cases of telepathy, a telepath is able, due to raw talent or training, to block out the cacophony of idle thoughts around them, and only concentrate on the specific target they are focusing on, it’s logical to assume that Aquaman wouldn’t be forced to hear every single “voice” in his specific area of the sea at all times. Unless they’ve changed it recently, Aquaman doesn’t have gills. Though would make him slightly interesting. Hey, neat! I now have even MORE respect for this dude I’ve been known to write for! Who says AquaMan isn’t some sort of jellyfish or moves via hydrostatic pressure? Maybe the “man” is just a facade over another creature. The interesting question is what properties a creature could have to adapt to AquaMan’s environment and have his exhibited abilities. Write another! I wanna read it!